realizing that the evidence against her could rise to the level of treason, Secretary Clinton has struck a bargain with the Obama White House that in return for bowing out at or near the convention, she will receive a full pardon in order to ensure that she will never see the inside of a prison cell. She takes the slings and arrows, exhausting the opposition research budgets of Republican campaigns, leaving V.P. Biden and Sen. Warren largely immune from scrutiny during these long months of primaries and caucuses. By the time she begs off the nomination, citing medical issues, the Republicans will have barely three months to investigate and counter the actual nominees, Biden and Warren. Of course this assumes that the White House does not pressure the FBI to back off of Hillary. But suppose Hillary avoids getting indicted until after she gets the nomination? I think she will still run. It's happened before. In the 1920 election, US Socialist Presidential candidate Eugene V. Debs ran his campaign from the Atlanta Federal Penitentiary under the slogan “From the Jailhouse to the White House.” He received nearly a million votes. 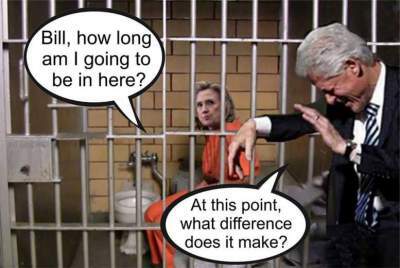 I suspect that Hillary has millions of idiot admirers that would still pull the lever for her even if she were behind bars and millions of idiot anti-Trumpers that would vote for her as well. If she somehow becomes President, her first executive action will be to pardon herself. Don't think she can win even from prison? 5 reasons why she might here. For original image before photoshop click here.